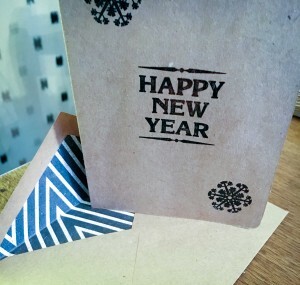 A handmade card and envelope . Kendra and Travis are a wonderful couple who live just a few blocks away from me. As you’ll read in my letter, I met them back in 2011 when I was doing my Year of Volunteering. I signed up to volunteer at the Our City Film Festival – now called simply Our City Festival. 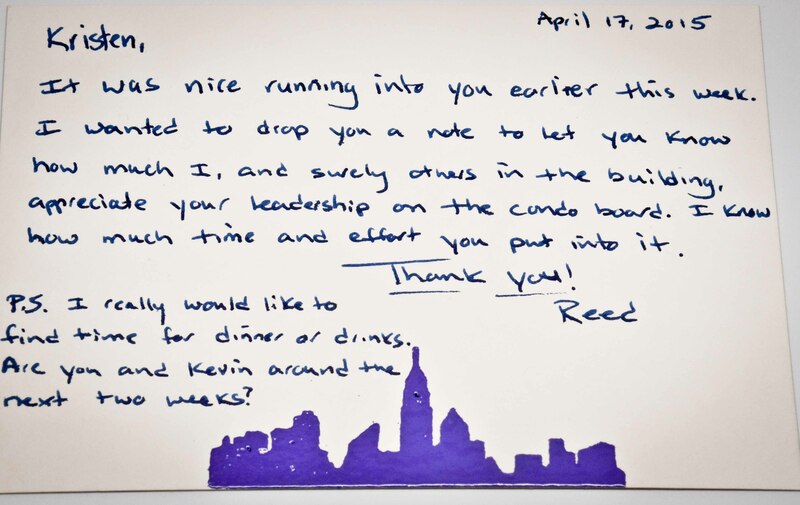 The backstory about the joke in the letter about the volunteer named Roy is that he turned out to be Kendra’s father. She was giving him a hard time and I thought, poor guy just came out to volunteer! 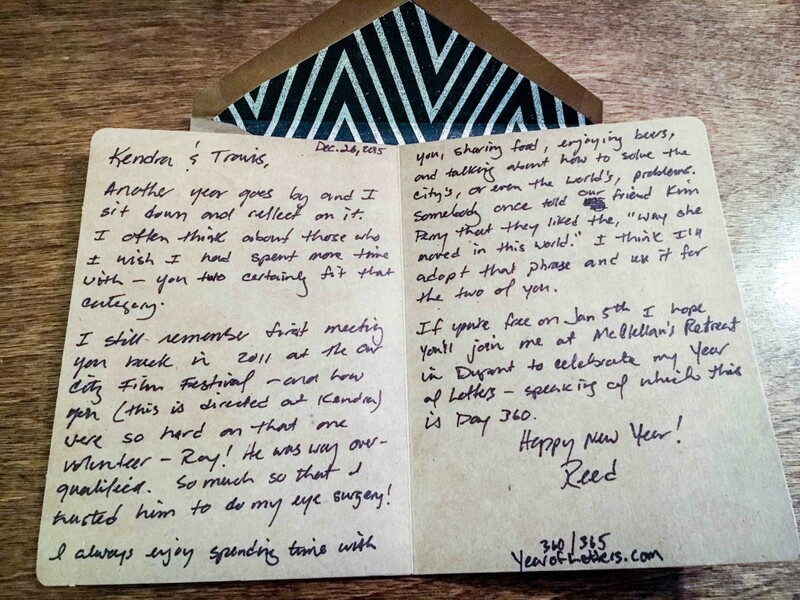 It turns out he is a world-renowned eye surgeon and successfully performed my LASIK surgery two years later. Another year goes by and I sit down and reflect on it. I often think about those who I wish I had spent more time with – you two certainly fit that category. I still remember first meeting you back in 2011 at the Our City Film Festival – and how you (this is directed at Kendra) were so hard on that one volunteer – Roy! He was way overqualified. So much so that I trusted him to do my eye surgery! I always enjoy spending time with you, sharing food, enjoying beers and talking about how to solve the city’s, or even the world’s, problems. Somebody once told our friend Kim Perry that they liked the “way she moved in this world.” I think I’ll adopt that phrase and it use it for the two of you. If you’re free on Jan. 5th I hope you’ll join me at McClellan’s Retreat in Dupont to celebrate my Year of Letters – speaking of which, you are Day 360! 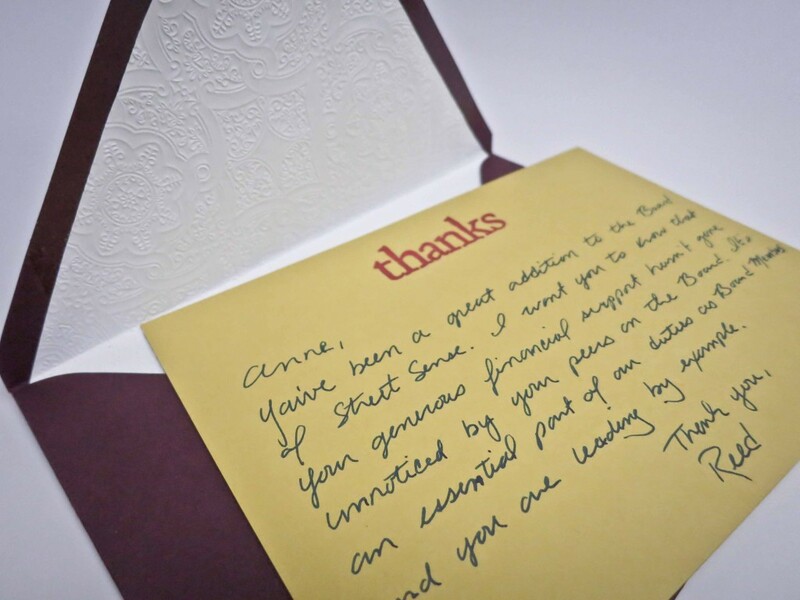 A thank you note to one of my fellow Board members at Street Sense. Sometimes you need to take a moment and write the words that you feel – don’t assume the other person knows that you care. You’ve been a great addition to the Board of Street Sense. I want you to know that your generous financial support hasn’t gone unnoticed by your peers on the Board. It’s an essential part of our duty as Board Members and you are leading by example. Thank you. Have you ever served on a home owners association board? I did it for three years and can tell you that it can be a thankless job – and that’s not even the right word since you don’t get a dime for all of your hard work. I’m fortunate to have a great president of our condo association. I ran into her earlier this week and it reminded me that I should send her a note telling her how much I appreciate her service. Do you know someone who is volunteering their time for the benefit of others? Drop them a note to let them know you appreciate them. It was nice running into you earlier this week. I wanted to drop you a note to let you know how much I, and surely others in the building, appreciate your leadership on the condo board. I know how much time and effort you put into it. P.S. I really would like to find time for dinner or drinks. Are you and Kevin around the next two weeks?